May 6, 2016, 11:16 a.m.
With its new Pluto-focused project, upcoming episodic series, and experiments with “meditative VR,” The Times is experimenting with different applications for the new technology. By Ricardo Bilton @rbilton May 6, 2016, 11:16 a.m.
With virtual reality, The New York Times has told viewers the stories of young refugees, taken them on the campaign trail, and helped them experience mourning in Paris. Now, it’s taking them to Pluto. The new project marks a significant milestone for the Times. Unlike its previous VR projects, which were created in tandem with VR production companies such as VRSE, its Pluto experience was created entirely by the Times science department and graphics desk. 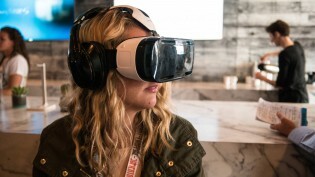 That’s evidence both of the Times’s commitment to the tech and of newsrooms’ evolving grasp of what it takes to produce videos with the technology, said Sam Dolnick, The New York Times’ editor overseeing VR. “There are a lot of new questions about the technology, about the storytelling, about the editing. Part of what’s exciting is that everyone is figuring it out. Even the experts have only been doing it a year, so it feels very wide open,” he said. Dolnick said that virtual reality is at its best when it transports people to places they can’t visit on their own, making a virtual trip to Pluto one of the most powerful applications of the technology. But The Times has other projects in the works. This week it said that it’s also working on its first crop of episodic series, evolving the one-off approach to virtual reality that it and other news organizations have taken. Ricardo Bilton: “Seeking Pluto’s Frigid Heart” and “The Displaced” feel like they’re going for very different things. What ties them together? Dolnick: They’re are very different films, but the thread between the two of them is that they’re both smart uses of the medium. With “The Displaced,” what we kept hearing was that viewers were able to connect with the children in the film in a way that’s difficult with a traditional news article. We’ve written hundreds of stories about the refugee crisis, but what we kept hearing from people was that they had become somewhat inured to it. But with this new medium, they were making eye contact with these kids and it shocked them in a profound way. The Pluto project is a different use of the medium in that it takes you somewhere that you can’t go but lets you experience the wonders of another planet in a way that a traditional tech story, or even a traditional video, can’t really convey. Bilton: So how do you keep people engaged? A lot of these VR projects make a big splash at first and then people quickly forget about them. Dolnick: We don’t expect our VR app to be a daily habit in the way that the core app is. But we have found lots of ways to bring people back. We send push alerts out when when we have new videos. We have email newsletters. We do homepage promotion. We do mobile and social promotion. We have lots of channels to reach people. We’re also excited to launch those episodic series this year. The idea is to do proper VR shows that have a through-line and episodic structure. We think that will go a long way toward bringing people back. Bilton: Obviously another big part of this is that you have to get the equipment in people’s hands. Dolnick: Yeah. Had we made our first video and called it a day, no one would have watched it. It wouldn’t have been a big deal. The reason that it resonated was because Google took a gigantic leap of faith to deliver, with us, a million Cardboards. The headsets are crucial. Dolnick: We are going to keep going after the big stories, but we’re also going to do VR films that look at the worlds of style and culture. The New York Times contains multitudes. We’re also experimenting with formats. We’re looking at an experience that we jokingly call “meditative VR.” These are single-shot, no-cuts videos of some beautiful place. You’re at a Jamaican beach at sunset, a Canadian waterfall, and you’re just there. And you look around. There’s no story, there’s nothing happening. I don’t even think it’s necessarily journalism. It’s just transportive and something that can be really powerful in VR. Bilton: One of the byproducts of this being a new technology is that you’re dealing with some new ethical questions as well. With “The Displaced,” there was some concern about how the producers needed to hide so that they weren’t in the frame of the 360-degree camera. Is that kind of ethical issue inherent to the technology? Dolnick: That’s not correct. VR is no more stage-managed than other films. You put the camera down, and often you just leave the room and see what happens. The video journalist Ben Solomon, who co-directed “The Displaced,” says that shooting video is like hunting with a rifle — you know exactly what you’re going after. Shooting VR is like setting a bear trap. You put it down and hope for the best. So it’s a different kind of storytelling, but I don’t think it’s right to say it’s inherently journalistically compromised. There’s a way to do it that’s disingenuous, but that’s not the way we’re doing it. Bilton: It seems that the ethics of VR, journalism-wise, are going to be pretty fluid as people adapt to creating with the new technology. Dolnick: It will be different. Traditionally, in documentary work, the video journalist doesn’t appear. They’re behind the camera, out of the frame. Maybe we’ll accept that, in VR, the director is in the frame and you can see them there and that’s part of the transparency. The most important thing is that the viewers understand what we’re doing and what they’re seeing, and that we’re transparent and clear about the entire process. POSTED May 6, 2016, 11:16 a.m.
Bilton, Ricardo. "The New York Times is trying to make VR films that aren’t one-offs, and that keep readers coming back." Nieman Journalism Lab. Nieman Foundation for Journalism at Harvard, 6 May. 2016. Web. 20 Apr. 2019. Bilton, Ricardo. "The New York Times is trying to make VR films that aren’t one-offs, and that keep readers coming back." Nieman Journalism Lab. Last modified May 6, 2016. 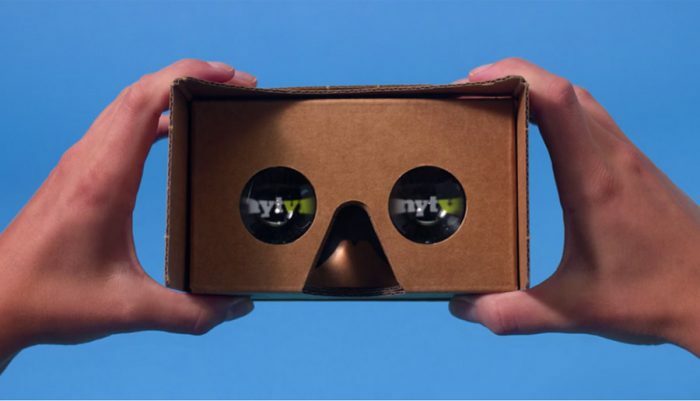 Accessed April 20, 2019. https://www.niemanlab.org/2016/05/the-new-york-times-is-trying-to-make-vr-films-that-arent-one-offs-and-that-keep-readers-coming-back/.